Could you please speak, um, down? Please, for the love of Mike, speak down. The person sitting across from you can hear you. Have you seriously never noticed the painful wincing coinciding with each and every SHOUTED syllable emanating from the bullhorn below your nose? It’s not obvious to you when that elder loved one not-so-surreptitiously reaches up to turn their hearing aid down — all the way? Heck, I’m in the K-Mart 4 blocks down the street and I am literally sprinting for the noise cancelling headphones. You don’t need to shut-up. You’re probably very nice, and I’ll bet you smell really good too. But, please, contain the waveform. Lower your voice! I was recently riding on the train, sitting behind 4 perfectly normal people who were lodged in a 2×2 facing seat cluster. Well, 3 normal ones. At one point, the gentleman to my Northwest (I’m facing North) ventured to speak to his unsuspecting seatmates. Did I say speak? Shout. Yeah, that’s the word. Ad nauseum, for a couple minutes. But yours truly, every treacherous, deployed the solution FTW! Barlow Girl: Grey. This just happened to be playing on my laptop. And, oddly enough, there’s a volume control dial on my headset . Which way do you think I twirled it? “GREY’S MY FAVORITE COLOR!” ← actual lyrics, coooool. Whippety-blinkit, I parried! A super savoir-faire, eyebrows-raised and utterly piercing gaze focused intently on Mr. Boomer. Toss in a delightful and wickedly subtle smirk . Hold gaze. And … … … … … … pθwned! Heads swivel to normal, thumb deftly crushes headset volume back to a sweet, soothing level. And a major win for quiet, rest of the trip. 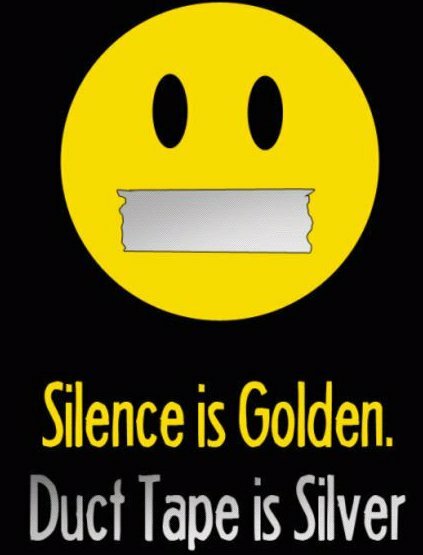 A big shout out for silence! Chalk me up for one courtesy violation. I’m willing to serve the time.